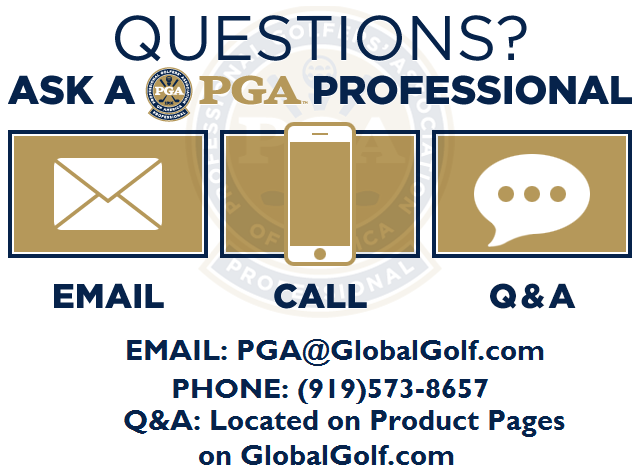 The PGA Show is referred to as the “Major of Golf Business.” It attracts industry professionals from across the country and overseas, gathering in Orlando to see the latest and greatest from over 1,000 companies! We took you along with us on our social channels during the Show and in daily recaps but we wanted to give a complete picture of our experience. Our highlights include exclusive interviews, chats with industry leaders, and seeing new products first hand. Continue reading to take a few steps in our shoes as we recap the 2019 PGA Show. The PGA Show started off with a bang for us as our CEO, Ed Byman, made an appearance on Golf Channel’s Morning Drive with Damon Hack. Ed spoke about the history of our U-Try program and what we have planned for the program in 2019. He also explained the benefits of pre-owned equipment and how the cost savings help more people enter the sport. Watch the entire interview below. Another highlight of our time at the PGA Show was spending time with the presidents of Wilson Golf and PING, Tim Clarke and John K. Solheim, respectively. 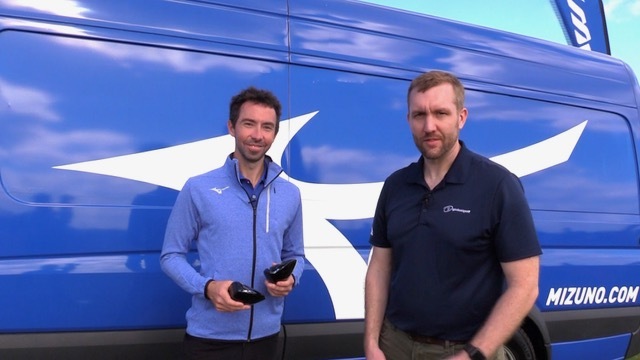 With Mr. Clarke, we discussed the favorite parts and learning points of Driver vs Driver 2, the adoption of the Wilson Staff Cortex driver in the market, signing Gary Woodland, and more. Our conversation with Mr. Solheim revolved around the history of PING, growing up in a family run business, and their unique R&D process. We also asked him what excites him most about the G410 lineup, which features a first for PING drivers, but more on that later. Callaway uses a revolutionary manufacturing process to create the face of the Epic Flash driver. The result is what Callaway calls Flash Face. We spent some time with Dr. Alan Hocknell, Sr. VP of R&D at Callaway and one of the key minds behind the development of the new face. He shared how A.I. was used to create 15,000 iterations of the face to come up with a design that produces more ball speed and distance. He also explained how using the face design effects the design of the rest of the club head. It was a fascinating conversation and will be interesting to see if golf clubs are designed this way in the future. 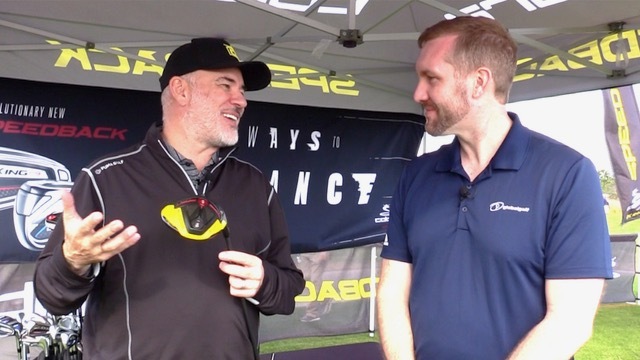 Tom Olsavsky, VP of R&D at Cobra Golf, ran us through the new Cobra KING F9 lineup, each made for speed. Every club in the line features Speedback technology, which optimizes the CG location to deliver the best performance for each club. Additionally, Tom talked about the CNC milled face, which ensures consistent thickness, expanding to the KING F9 fairway woods. The other big topic of discussion was the improvements of Cobra’s KING F9 Speedback One Length hybrids and irons. One length clubs are built to 7 iron length and weight for a repeatable setup and swing. Tom shared the improvements to CG, new shafts, and wider sole. 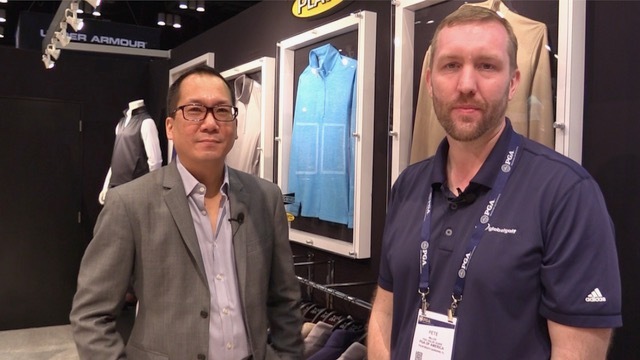 They say “clothes make the man” and we learned that at the 2019 PGA Show from Danny Gee, VP of Design for the Greg Norman Collection. He took us through each piece of their upcoming apparel line. The apparel not only looks good, but there are also several benefits while on the golf course. One piece in particular really caught our attention, causing an audible “Wow” when we first touched it. Without giving too much away, it is the lightest polo we’ve ever seen. Imagine wearing a polo that’s light as a feather and equally as soft and you’ll have this new polo. Keep an eye out this year for their launch. The rest of the line uses premium material and construction with subtle touches of style, having you look your best at all times. After some time away, Mizuno returned to the PGA Show with a bang. 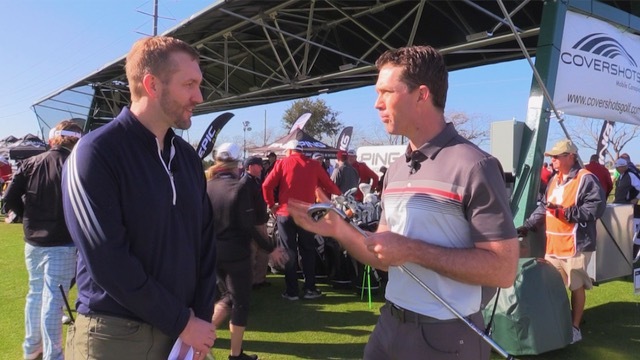 Chris Voshall, Brand Manager, spoke with us about the new ST190 and ST190G drivers, all new Hot Metal Pro irons, and the launch of a new Mizuno golf ball, coming to the United States for the first time. The most noticeable improvement on the drivers is the color, going from the blue of recent releases to a sleek black. Chris explained the improvements to create more ball speed and what the difference between the 2 drivers is. The Mizuno Hot Metal Pro irons look (and feel) amazing. They take all the performance benefits of the JPX 919 Hot Metal irons and packs it in a smaller head shape with a thinner topline and less offset. He also filled us in on the new golf balls, RB Tour and RB Tour X. Notably, the golf balls have a cone-shaped dimple pattern, reducing drag for less spin and more carry distance. Mizuno has been making golf balls for a while but used exclusively in Europe and Asia. These new golf balls will be used worldwide. Marty Jertson, Director of Product Development at PING, informed us all about the G410 drivers, fairway woods, hybrids, and irons. Adjustability is the big story in the drivers. For the first time, PING uses an external weight to dial in ball flight. Users can switch a weight between a draw, fade, or neutral position to promote a particular shot shape. The adjustable hosel also gets a redesign, adding more settings for users to choose from. 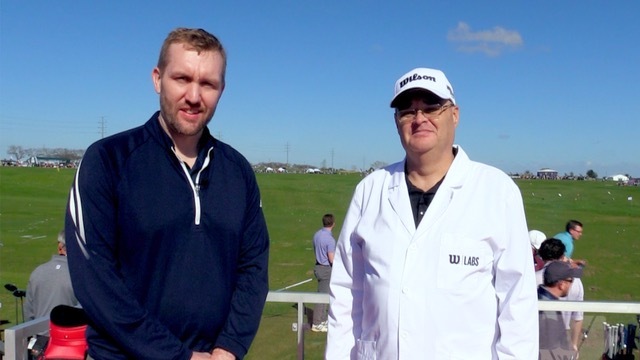 We’ve spoken with Frank Simonutti, Golf Ball Innovation Director at Wilson Golf, in the past, learning about the Wilson Staff DUO Soft golf ball. 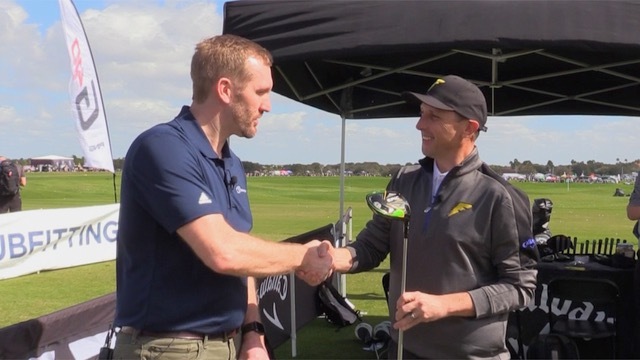 At the 2019 PGA Show, Frank taught us all about the DUO Professional. This new 3-piece ball has a urethane cover that delivers tour-level performance with an ultra-soft feel. It’s got a compression rating of 60, the lowest for a 3-piece ball on the market. We can’t wait to get it out on the course. 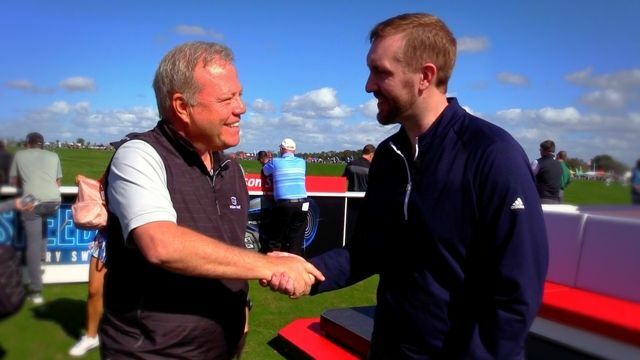 We’ll be putting up all of these interviews, and many more from the 2019 PGA Show, on our YouTube channel, so stay tuned. Better yet, subscribe to our channel so you never miss one of our videos. You can also stay up-to-date with what we’re up to on our Facebook, Twitter, and Instagram channels.